Update: Samsung also launched the Beta in the US so we can see the changelog in English. Aside from detailed changes in various Samsung stock apps, the update uses Samsung’s new One UI which includes gesture controls and a more reachable interface with tabs and buttons at the bottom. 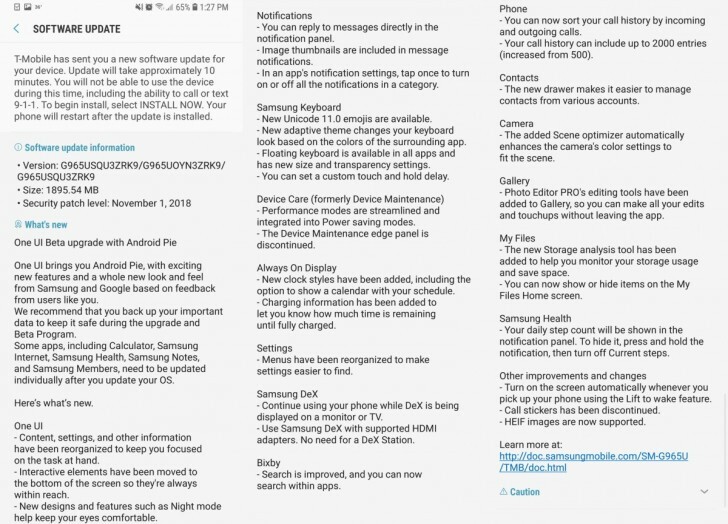 It’s starting – Samsung is rolling out a beta version of the One UI update to Galaxy S9 and Galaxy S9+ phones in South Korea. This update brings with it Samsung’s revamped interface built on top of Android 9.0 Pie, plus several other improvements. Samsung DeX is free from the dock and can be used with any USB-C to HDMI adapter. Another neat change is that you can tune the camera’s color rendering to your liking. Note that some of the Samsung apps will need to be updated through the Galaxy App store. They have new functionality too. For example, Samsung Pay now has a new interface to manage debit cards. Also, Samsung’s file browser can analyze files in the phone’s storage and help you clear out the cruft (similar to Google’s Files app). It’s a pretty massive upgrade, about 1.6GB, so it will take a while to download and install. Again, this is happening in Korea right now, but should expand to other regions.